Hi everyone!! 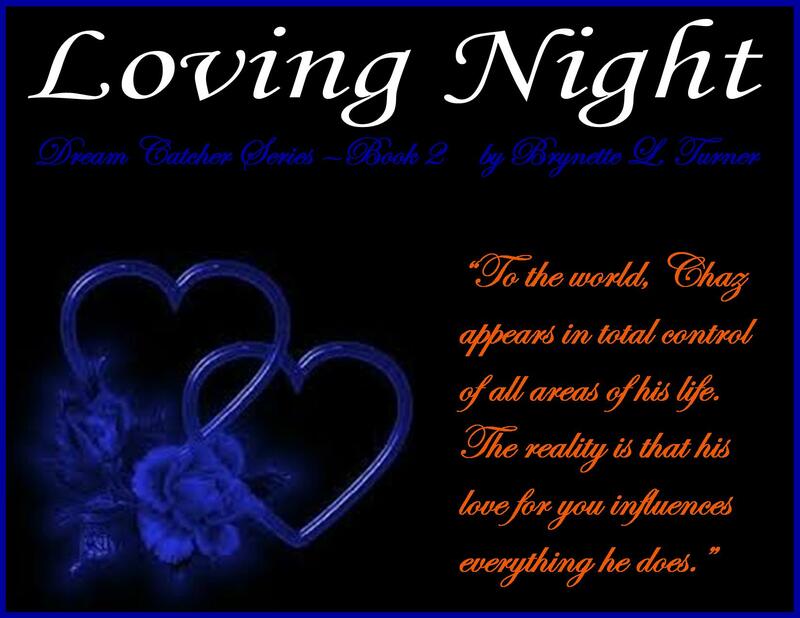 Today, I’m very excited to share with you all Brynette L. Turner’s latest release, Loving Night! This is the second book in the Dream Catcher series, but you can read this story as a standalone (like I did). This book has everything an avid reader will enjoy: Romance, suspense, intrigue, and HOT chemistry among the main characters. It’s a story that will grab your attention with every page until the end of the story. Chaz took a desk job at the FBI to protect the woman he loves from the psychic connection that pulls her into the middle of his dangerous investigations. Yet, when he is forced to lead another undercover assignment, she must be the one to keep him safe. Stephanie woke up and stared at her husband. His face was inches from hers, his warm breath slid across her cheek, and his arm rested protectively around her waist. But her heart was pounding, thanks to the images that had floated through her mind while she slept. The strangest thing about her dream was that it was clear, even though this was the first time she’d had it. Usually, the dreams were vague and she would have them more than once before all of the details were decipherable. There was no ambiguity this time. History taught her that either the event had happened or it was going to happen within the next day or two. Instinct told her that it would happen that day. She choked back a whisper of panic. Hadn’t she promised to be tough? Hadn’t she made a conscious decision that she would support Chaz in whatever he wanted to do with his career? Everyone thought he was happier as an undercover agent, and now the day had come when she would have to prove her fortitude. She glanced at the bedside clock. The alarm would ring in half an hour. Carefully removing Chaz’s arm, she slipped from beneath the covers and quietly made her way to the walk-in closet. She closed the door behind her before turning on the light. It only took a few minutes to decide what she would wear to work and set the outfit aside. During that time, she decided that she’d tell her husband about the dream over breakfast. They had agreed to handle her dreams that way—no delaying anything that involved him or his job. She nodded as if agreeing with herself, took a deep breath, forced down her anxiety, and went downstairs. Cooking would relax her. They’d have a big breakfast today. Chaz wanted to laugh when he walked into the kitchen an hour later and took a look at the counter. Bacon, sausage patties, potato pancakes, biscuits, fruit salad, and juice. The scent of coffee mingled with everything else and made his mouth water. Stephanie, who was standing in front of the stove with her back to him, was vigorously whisking eggs. Chaz didn’t answer right away. Instead, he poured himself a cup of coffee, leaned against the counter while he sipped it, and studied his wife until she turned to him with a puzzled expression on her face. A few minutes later, she dumped half of the eggs onto each plate and joined Chaz at the table where he was already munching on a slice of bacon. She could feel him staring at her as he chewed and she took her time spreading butter on the fluffy bread. How she phrased her next words would be very important. He nodded and took a sip of juice. His eyes never left hers. “That’s right. This might be a good decision for my career, but honestly, I don’t want to be away from you,” he admitted. “I also don’t want to miss celebrating one single special moment with our child. I want to be on the floor teaching her to roll a ball and holding her hands while she’s learning to balance and taking her first steps. She’ll need to hear my voice reading goodnight stories from the moment she comes home from the hospital and feel my hands cuddling her when she’s grouchy from teething. She needs to know how much love is in my heart just for her. She deserves that; I deserve it.” He reached across the table and linked his fingers with his wife’s. “Besides, I don’t want you being a single parent for months at a time—and that’s what it might be. We’re building this life together, Stephanie. Together.” He stood and pulled her into his arms. Stephanie tightened her arms around him. What he said sounded wonderful. But she knew what she had seen, and her gift was rarely wrong. She returned his kisses and kept quiet. 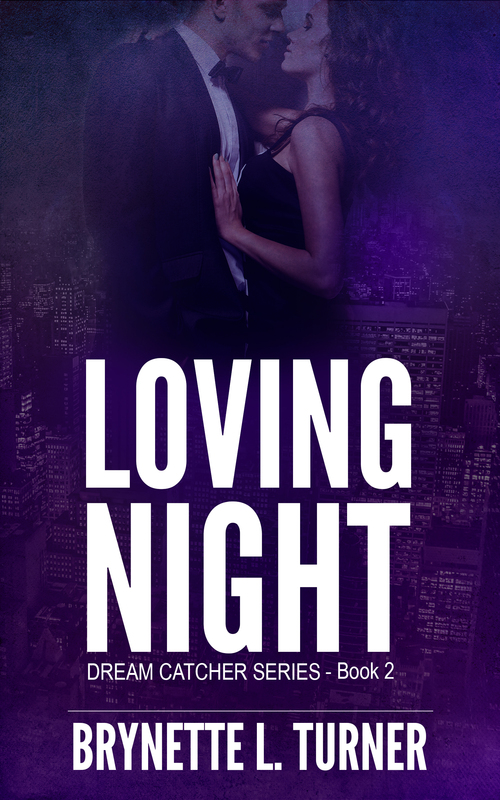 Loving Night was the first book I have read from Brynette Turner, which I truly enjoyed. This was such a wonderful book that displayed all of the elements of a great story: Romance, excitement, suspense, and intrigue. I loved the relationship between Stephanie and Chaz. I loved the fact that Chaz was so in love with his wife and would sacrifice everything for her. The chemistry between the two were amazing and it showed that love really does conquer all. The best thing about this story is that the two worked together as a team as they faced several obstacles in their relationship. No matter what issues they were facing, they never lost sight of the love they had for each other, which was the most important message in the story. Although this was the second story in the Dream Catcher series, this is a standalone novel, but I will read Premonitions to see how the relationship between Stephanie and Chaz started. Now that I read Loving Night, I can’t wait to read Heart Shadows, which is the third book in the series.